Lego Island: A 3D Action Adventure CD-ROM Game. Reviewed! 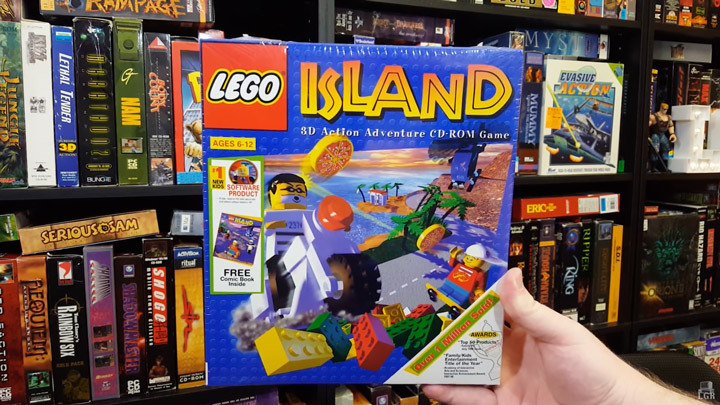 Lego Island was the first PC Lego game way back in 1997. It proved a success with over 1 million copies sold and multiple awards. The game described itself as: “There is so much to do on Lego Island: building, racing, flying, water jetting, skateboarding, and just kickin’ with your firends… unless you accidentally let the Brickster out of jail.” The video game had a small cast of characters. The police officer Nick Brick, police officer Laura Brick, the pizza delivery dude Pepper, the pizza chef Papa Brickolini, music and pizza fan Mama Brickolini, and finally the Infomaniac. This game oozes with mid 90’s attitude. The forced attitude that only companies at the time thought was cool. Check out this review, by Lazy Game Reviews (LGR) of Lego Island. It is a very unique piece of Lego history. Everything is Awesome! – Music Video by Tegan and Sara, and The Lonely Island.